We believe that every child has the right to an education. Caring for the most vulnerable includes supporting those who do not have access to the traditional systems. MSC places a priority on providing an individual education plan for all of our residents with unique needs and disabilities. Many of our residents attend public schools when feasible. MSC also provides education outside of our residential programs at the Little Angels Learning Centers in Jamaica and Zimbabwe. The education of our residents is of utmost importance in our philosophy of care. Given the widge range of disabilties among our residents, there are unique needs for each child's learning process. Children and young adults who are part of our Dare to Care program for persons living with HIV/AIDS typically attend public schools outside of MSC. Whenever possible, we send Dare to Care children to outside schools to encourage their participation in everyday society. We remain mindful, however, of the social impact of their HIV status. If a certain schooling environment poses a risk to their development and psychosocial progress, we look to alternatives to ensure that our residents receive the education that is vital to their succuss. Our residents with disabilities attend specialized local schools when feasible. 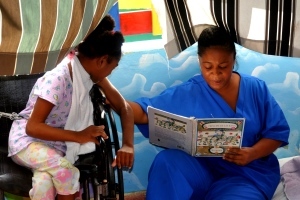 Some young residents in Jamaica who are more mentally and physically independent are taught in our Little Angels Learning Centers. At both of our homes in Nicaragua, we have a school and teacher on site to conduct classes for small groups of residents or on an individual basis. Read about the role of education in our Christ in the Garbage programs. Little Angels Learning Centers are Mustard Seed Communities schools, teaching a range of ages and education levels free of charge in locations around the world. At Little Angels we aim to provide the very best education for underpriveleged children in the communities we serve. The children participate in religion, music, Spanish, Computer Studies, and Physical Education classes. They are taught to develop their mental, physical, and spiritual selves. The first Little Angels Learning Center opened in Jamaica in 2002. The Ministry of Education manages the structure of our annual curriculum. Regular field trips are held to expose the children to their cultural and national heritage. Spirituality plays a vital role in the lives of both the teachers and the children with observation of Mass, adoration, and an annual retreat. In Zimbabwe, there are two Little Angel's Learning Centers serving 200 children through the provision of education and two daily meals. We offer basic preschool education to children under the age of 5 in order to prepare them for entrance into first grade at formal schools. The children attend morning prayers with the staff and actively participate in singing and spiritual activities. 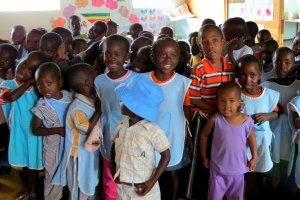 In Zimbabwe, Little Angels Learning Centers are located at the main property in Woodville and in Cabatsha alongside the nutrition programs at both of those locations.